[G]ood video games—which often are long, difficult, and complex—incorporate good learning principles for mastering the games. These principles, I argue, are also found in recent research in the learning sciences about how humans learn best. Video-game designers did not become familiar with these learning principles from the learning sciences, nor did the learning sciences use video games as a basis for research. Rather, this is a matter of convergent development. Video games are largely just problem-solving spaces; if people could not learn them well and in an engaging fashion, the companies that make the games would go out of business. So it is, perhaps, not surprising that game designers have hit on—and even innovated on—many of the learning principles that contemporary research in the learning sciences has argued work for deep and effective human learning. … [W]e should use these principles, with or without games, for learning inside and outside of school in areas that we value. The growing work on games and learning has led, however, to more and more interest in using not just the learning principles but video games themselves (both commercial entertainment games and “serious games”) in schools and other learning sites. Other people have come to the issue of new digital media and learning via other digital technologies than video games, such as social networking tools, media production tools, information tools like blogs and wikis, or a great many others. However, nearly everyone who has come to this issue has been impressed by the ways in which popular culture today is using digital tools and other devices to engage in powerful, deep, and complex thinking and learning outside of school. Popular culture itself thus has become a focus of the new work on digital media and learning. For many young people, the digital and the nondigital fully intermix. Phenomena like Pokemon and Yu-Gi-Oh! are represented across a number of different media, including video games, card games played face to face, books, television shows, movies, and a plethora of Internet sites, including fan-fiction writing sites. Furthermore Pokemon and Yu-Gi-Oh! intermix in young people’s popular culture with each other, with similar card games (e.g., Magic: The Gathering), and with the anime world more generally. In popular culture today, media and technologies (digital and nondigital) converge. An equally impressive phenomenon has been the ways in which digital tools have allowed “everyday people” to produce and not just consume media. Today, they can use digital tools to create movies, games, music, newscasts, and many other things. And the products of these efforts can compete with professional work in appearance, and often in quality. Second, with today’s digital tools for social networking, people easily and readily can form and re-form groups to engage in joint activity (such as writing fan fiction) and even political interventions (such as campaigning) without the sanction and support of formal institutions. So participation today involves participating in both producer communities and in many other fluidly formed groups organized around a myriad of interests and passions. Finally, a number of people working in the area of new digital media and learning have pointed out how today’s popular cultural activities often involve quite complex language, thinking, and problem solving. The plot of a TV show like Wired—with its many subplots and complex relationships among its characters—is so complex that old-fashioned TV shows pale by comparison. The language on a Yu-Gi-Oh! card or Web site is more complex, technical, and specialist than many young people see in school. The thinking, problem solving, and collaboration skills required to engage in video game “modding” (modification) look more like important twenty-first-century skills than do the skills on offer in some of our skill-and-drill-test prep schools. So do the social, technical, and organizational skills required to lead a guild in World of Warcraft. It even appears that the reasoning required to engage in debates on many Internet forums involving technical matters (e.g., making mods for Warcraft) often resembles valued forms of scientific reasoning, forms that we have difficulty gaining in school with all our textbooks. We live, then, in an age of convergent media, production, participation, fluid group formation, and cognitive, social, and linguistic complexity—all embedded in contemporary popular culture. Digital tools help create and sustain these features of “modern times,” but they do not stand alone and cannot be studied in isolation from these features. 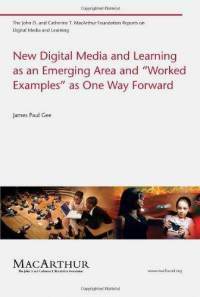 All this leads me to a value-laden statement about what I see as one fundamental principle that, in my view, has begun to unite some work on digital media and learning: The emerging area of digital media and learning is not just the study of how digital tools can enhance learning. It is, rather, the study of how digital tools and new forms of convergent media, production, and participation, as well as powerful forms of social organization and complexity in popular culture, can teach us how to enhance learning in and out of school and how to transform society and the global world as well.